And He hath brought us unto this land, even a land that floweth with milk and honey. We are a small, family farm located on 23 acres in Columbia, Tennessee. 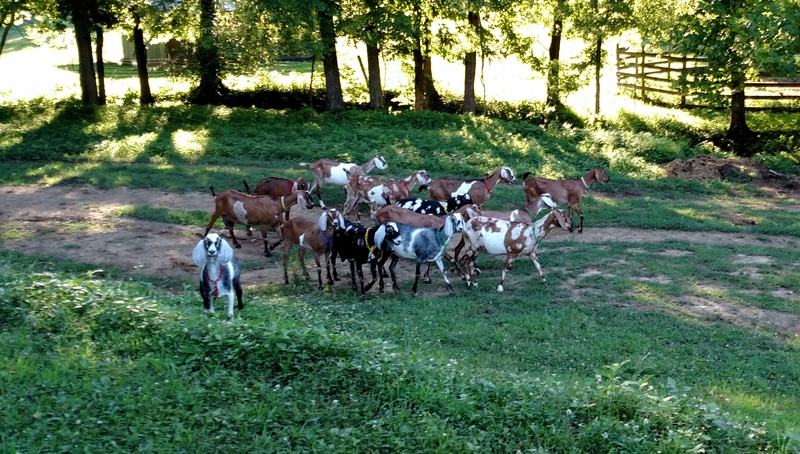 We raise registered, purebred, Nubian dairy goats. We became interested in goat's milk 14 years ago, for health purposes. We discovered we not only loved the milk and the benefits it brought to our health, but we also loved this amazing animal that provided us with this wonderful milk. We started with three girls and our herd has grown, slightly. All of our goats are registered with the American Dairy Goat Association. Our herd is CAE negative and CL free. We strive to maintain a healthy herd because we not only have much invested in them, but it's also our responsibility to care for this creation we have been entrusted with. Besides the Nubian goats, we also have several other animals on our farm. There's our Australian Shepherd, Cowboy, who we couldn't do without. We have three horses, Chance, Candy and Fancy Pants. We have two donkeys, Emma and Ellie Mae that are amazing with our goats and seem to think the herd belongs to them. We are down to two Jersey cows, now. We also have chickens, barn cats and a couple of bee hives. We hope you enjoy our site. Contact us if interested in anything we have available.